I attended the Broadband Forum in Johannesburg this week, organised by Research ICT Africa, the Association for Progressive Communications and the Shuttleworth Foundation. You can read a summary of my presentation on content and broadband the South Africa Connect blog. A number of interesting ideas came out of the presentations and discussions. are much poorer than ours. 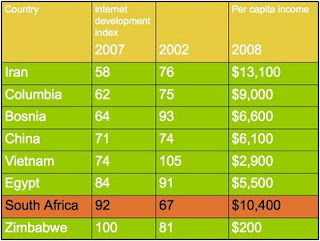 The table combines information from the latest International Telecommunications Union ICT development sub-index for internet usage with per capita income figures from the CIA (!) 2008 World Factbook. Every country in the table was behind South Africa in internet usage index 5 years ago. Now only Zimbabwe is lower in the rankings. we need to close, not increase, the digital divide within our society. If we do not we are likely to increase the economic and developmental gaps (already widening in South Africa) between haves and have nots, and weaken the social contract binding common interest in society. This argument is well rehearsed in terms of rights for the poor and is similar to arguments made for access to water, electricity and other utilities. If we do not provide universal access we will, over time, undermine the social network of the nation - in other words, while people will be connected, we will not be able to say that the nation is connected. If the internet is as important to 21st Century economic development as the railways and postal services were to the 19th Century, then those parts of the country left unconnected will end up disconnected from the country itself. This is not a new argument either. At the height of the development of national postal services, in the 19th century, many services were, in effect, nationalised and most nations created single price post from any point to any point in the country (even thought the costs obviously varied considerably by distance). This was a political act. We need a similar political commitment today. broadband is undermining, and probably destroying, existing mass media business models, and those media channels have already achieved near universal access. Radio and television in South Africa are good examples of this. If broadband does not offer universal access it could actually leave many (poorer) people worse off than they are now in terms of access to important national and global information sources. 3. How broad is broadband? In the course of preparing my input to the forum I came across a reference to a very interesting definition of broadband from the US Computer Science and Telecommunications Board: "local access link performance should not be the limiting factor in a user's capability for running today's applications". This addresses what to me is the most important issue: South Africa, just like any other nation, needs to think of connectivity in relation to the rest of the world. That, after all is what the net is about. And how connected you need to be is a moving target. Every year new tools are emerging and those tools are based on assumptions of how much bandwidth its users have access to. If we want South African citizens, organisations and businesses to have access to the best of these tools we need to have the same amount of bandwidth as the other countries who are using such tools. 4. Who should make this happen? 100 Euros per head is approximately equal to R40bn. I would love to get some economists to do a more thorough job of working out what level of investment is required. 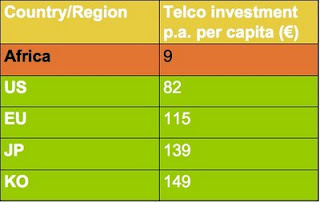 Then I looked at announced investments by telcos in South Africa. On an optimistic view, the figure I came to was less than R15bn per annum. So the question arises - who is going to fund the investment South Africa needs? The answer can only be: either the newly competitive market is going to lead to multiples of the current level of investment or the state needs to be involved. most interesting blogpost Indra, thanks very much.